Am/fm stereo cd, storage, swim platform, single axle trailer, battery new, wake tower, wake board storage locker, registered, original owner. This 2008 Sea-doo Speedster 150 is a fun wake boat that is fast and turns on a dime. The jet motor boasts 215hp and can travel as fast as 48 mph. The fully open COCKPIT has a right side driver�s seat and a Jensen CD/AM-FM stereo with speakers mounted in between the 3 seats (w/ipod port) for rocking out while on the water. The 4th seat is a rear facing spotter seat that is used to spot for wake-boarders or skiers. There is a swim platform to the rear and a recessed swim step that allows for access from the rear of the boat. The total length of this boat with trailer is roughly 15�5� which allows for storage in a standard sized 10 X20 � garage. The wake tower can be disassembled to allow the height adjustment. The interior flooring of the boat is non-slip surface which prevents slipping or sliding. There is plenty of storage in the rear compartment and 2 hatched storage compartments that are located, one that is located in front of the driver and the cooler is located to the left behind the rear facing spotter seat. All are lockable so that one is able to secure belongings while docked. It is great fun whether tubing, wake boarding or skiing. It has a recessed ski pylon that extends for skiers and a lighting rod in case of night travel. 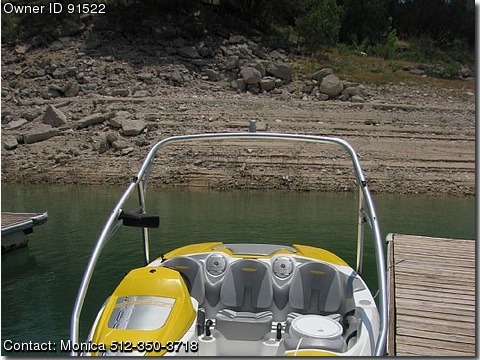 MAINTENANCE � This boat is in good shape and has had regular maintenance and repairs performed as needed. The battery and spark plugs were replaced in Spring 2011. The first real maintenance occurs at the 50 hr mark and this boat sits right at 30 hours. The sea-doo console displays the hours used, gas level and the water temperature in digital format. There is a wake locker in the floor of the boat which is also lockable. The trailer is a standard issue which accompanies Sea-doo products and the wheels have been grease treated. Why buy a new Sea Doo Speedster 150? This boat is virtually brand new.